Drexel’s newest cultural building was a long time coming: After years of bouncing around various temporary shelters, Drexel Hillel now has a permanent home in the vibrant and lively, accessible and inspiring new Perelman Center for Jewish Life. Organized Jewish life at Drexel dates back to the 1920s, and Hillel got its start on campus in the ’30s and ’40s. 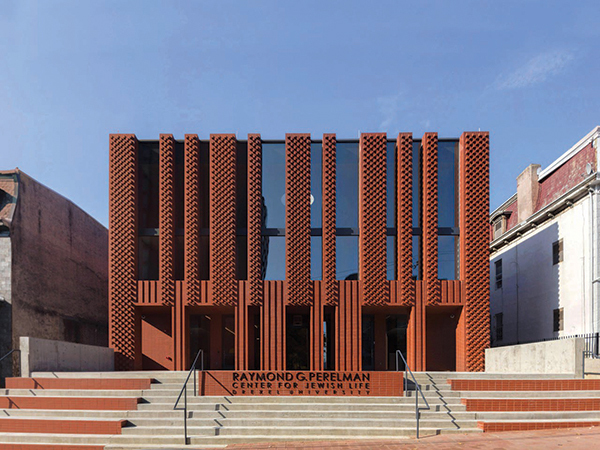 But it wasn’t until about a decade ago that efforts to create a more permanent center for Jewish students ramped up enough to shape what is now the Raymond G. Perelman Center for Jewish Life — the first standalone facility of its kind at the University. For years, Drexel Hillel’s base bounced around different spaces on campus; most recently it was at the Paul Peck Problem Solving and Research Building. “A long time coming,” says Campus Rabbi and Hillel Executive Director Isabel de Koninck, of Drexel Hillel getting a place to call home. The $10 million, 14,000-square-foot space — named for its major donor, Philadelphia-area philanthropist Raymond G. Perelman — opened its doors during Rosh Hashanah in 2016, and it now serves Hillel’s 650 students through direct programming and sees more than 1,000 visitors a year. It’s a comfortable and welcoming facility for students, faculty, staff and alumni to enjoy holiday services and weekly Shabbat dinners, Jewish education programs, programs facilitating opportunities in Israel, and much more, says de Koninck, adding that although it’s a hub for Jewish life, it’s also open to any student who wants to visit. 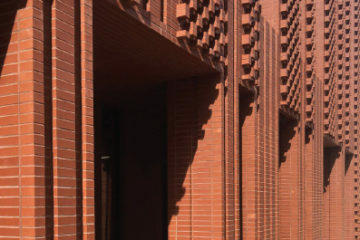 Located at 118 N. 34th St., amidst the Victorians and rowhomes on the north side of campus, the Perelman Center can be spotted blocks away by its stunning architecture, which has earned kudos for its unique design. Architect Stanley Saitowitz drew upon his own Jewish faith and also took into account Drexel students’ input “from day one,” de Koninck says, when designing the building. The Perelman Center is open Mondays through Fridays from 8 a.m. to 9 p.m., but it is frequently open on weekends, too. 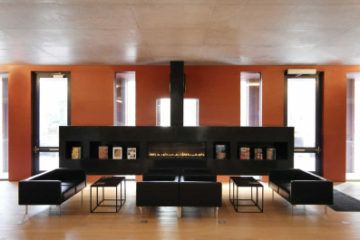 At any given time, de Koninck says, “It’s a bustle.” The first-floor lounge and community space boasts a fireplace that “students turn on all the time,” she says. “Students walk in, they plop down. It’s home.” In the summer, instead of having a formal Shabbat dinner in the Green and Fishman Families Dining Room, they’ll often do something more relaxed — moving two-top tables in front of the Ross Amphitheater, which faces the fireplace. “It feels a bit like a bistro,” de Koninck says. 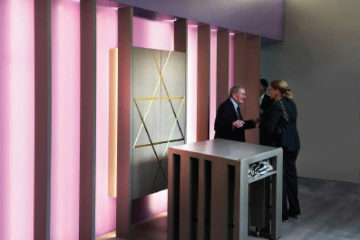 When the building becomes transformed for big parties, this space becomes the epicenter of the action. 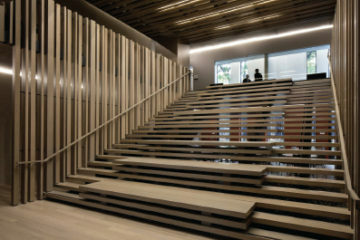 As soon as one steps inside the Perelman Center, the intricate Ross Amphitheater that occupies the center stairwell can’t be missed, or soon forgotten. Smack dab in the middle of the first floor, the particular space — perfect for film events or speaker series — can seat about 90 people and is used all the time. This past spring, world famous chef Michael Solomonov joined Drexel Hillel for an event, sharing his love for Israel through food. An interview in the amphitheater area was followed by a candle lighting ceremony to observe Yom Hazikaron, and then everyone was served a free dinner catered by two of Solomonov’s Philadelphia restaurants, Goldie and Dizengoff. Passing over the second floor — which is home to the Geltzer Student Lounge, as well as the Danziger, Kamens and South meeting rooms, and office space for Drexel Hillel’s staff — the third floor is anchored by its circular outdoor courtyard, named the Oculus. 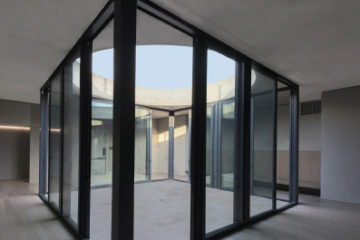 Light pours inside its glass walls from the aperture to the roof, which is open to the sky and the elements. Students often enjoy lunch outside here and sometimes, students will ditch the furniture, swapping it for yoga or other events under the sun or stars. “It’s a nice, quiet space for reflection and for gathering,” says de Koninck. The walls of the Oculus have also been used as a canvas for a gallery, recently displaying retired Drexel fashion design professor Renée Weiss Chase’s fabric arts Judaica collection. 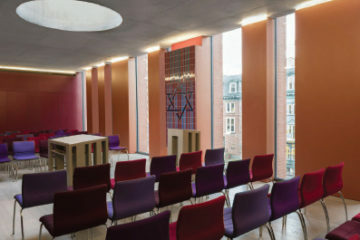 The third floor also is home to the Scheller, Fromm and South chapels, which cater in different ways to students from orthodox, reform or conservative backgrounds. The largest, the Scheller Chapel, is where Drexel Hillel hosts non-denominational, egalitarian, high holiday services. Between 70 and 90 people will fill the sanctuary to capacity, and throughout the course of those services, many stories of meaning and transformation are often shared, creating a “high spiritual mode,” says de Koninck. On a day-to-day basis, the Scheller Chapel, which houses Drexel Hillel’s library, is set up with large tables, meant for studying. At the end of the school year, lounge furniture has been moved up to the space to create a “private lounge” feel. It’s also been a space for wedding receptions for alumni, as well as award ceremonies. The new Perelman Center for Jewish Life looks absolutely amazing! Mazel Tov!!! I graduated Drexel in 1960 and wish there was such a beautiful and inspiring Hillel building then. God bless all the Jewish Drexel students and give them strength and courage in view of the rampant anti-Semitism that exists in American universities and among many faculty therein.